Metadata makes it easier to associate structured data with Lob objects. With metadata you can easily attach key-value pairs to postcards, letters, checks, and other objects. This data could include a campaign name, a customer segment, or an internal id. Check out our documentation for implementation details. Metadata objects can include up to 20 key-value pairs of custom data. Each metadata key must be less than 40 characters long and values must be less than 500 characters. Neither can contain the characters " and \. Metadata does not support nested objects. This data can be searched through and viewed in our dashboard as shown below. 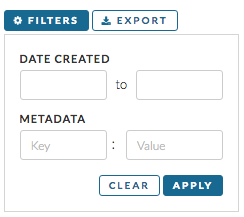 Using the filter button in the dashboard, you can filter metadata.